It’s National Hazelnut Cake day, in these United States. 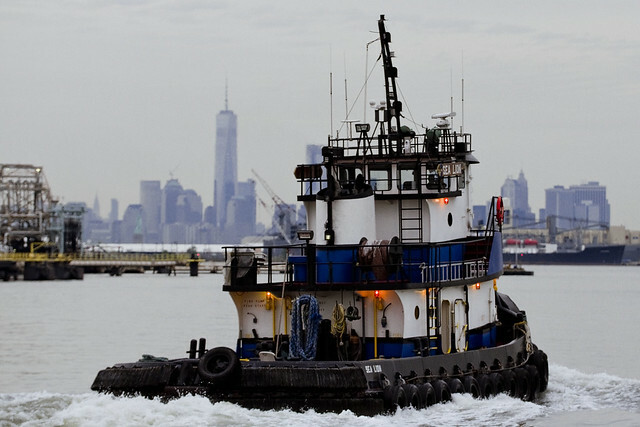 That’s the tug Sea Lion in the shot above, hurtling across the Kill Van Kull with an industrial section of Bayonne, New Jersey and the skyline of Lower Manhattan providing a backdrop. One hasn’t been focusing in on the harbor all that much in recent months for one reason or another, but it’s nothing personal, rather it’s an “art” thing. There’s only so many ways to frame and shoot a passing vessel, when you really get down to it. I’ll figure out some way to make it interesting again, as I was trying to do in the shot above by shooting “wide open” and going for depth of field rather than my normal “tack sharp” narrow aperture method for maritime shots. Sea Lion is looking pretty good, given that she sunk a few years ago off the coast of Long Island – check out NY Media Boat’s page describing that disaster. 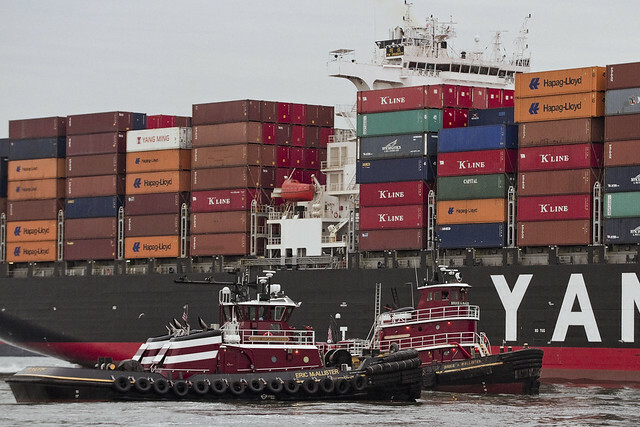 Passing out of the Kill Van Kull, and into the Upper Bay, three McAllister tugs were observed “wrassling” a cargo ship into position for it to exit NY waters. There’s two tugs pictured above, the Eric and Bruce A. McAllister’s, and the third one was on the other side of the cargo ship. I was onboard a NY Waterways boat hired by the Working Harbor Committee for a tour of Newark Bay, in my capacity as the group’s official photographer. These WHC trips have become quite a melancholy experience for me in the last few years, as I spend most of my time onboard reminiscing about a few buddies whom I always enjoyed hanging out or working with on these excursions that have left this mortal coil – Bernie Ente, Capt. John Doswell, and most recently John Skelson. Absent friends… lift glasses… clink. I didn’t observe the usual post op ritual which the WHC crew enacts this time around, heading over to a hole in the wall bar on Pearl Street for a pint to compare notes about the trip. Queens was calling, and given the intensity of my schedule during the month of May, I was of no mind to delay getting home to our Lady of the Pentacle and Zuzu the dog. 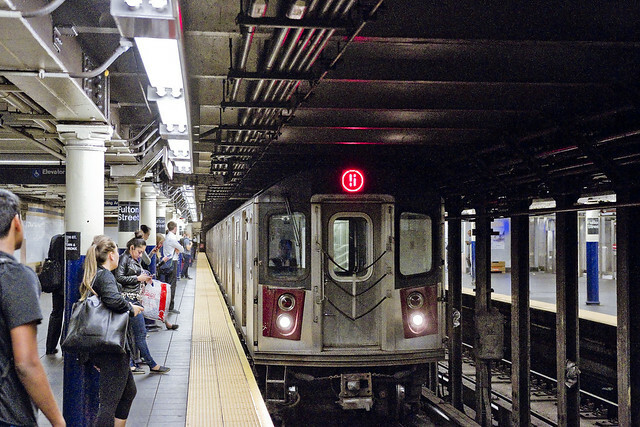 The 5 line carried me from Lower Manhattan to the 59th and Lex hub, where an R line transfer was enacted, which carried me home to the rolling hills of almond eyed Astoria. Did Mitch see this blurb for “Aerial America,” a show on Smithsonian Channel? The show on Sunday is a flyover of New York and Newtown Creek is mentioned. Linda Gage, Auburn, WA (originally from [shudder} Manhattan).